Japanese society is globalizing rapidly: interaction with people of different cultural backgrounds has become a permanent fixture in our everyday lives. 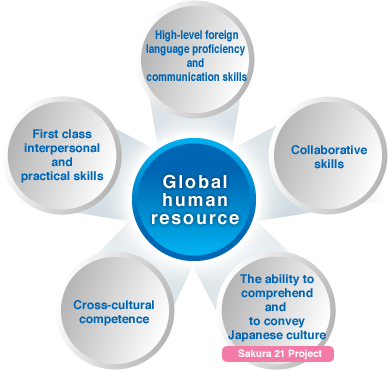 This shift has given rise to a new demand for individuals who possess the following qualities: the ability to talk lucidly and confidently with both foreigners and Japanese alike; specialist knowledge and knowhow; the skills to communicate such knowledge and knowhow; and the ability to cooperate with others, regardless of cultural or linguistic barriers. In 2012, Aichi University was the only private university in the Central Japan region to be selected by the Ministry of Education, Culture, Sports, Science and Technology for funding under the Go Global Japan Project. Originally established in 1997, the faculty's long-term commitment to its unique China-based hands-on education programs, pragmatic approach to Chinese language education and its new Sakura 21 initiative were highly praised. Aichi University is now seeking to roll out the scheme on a university-wide basis, using the Faculty of Modern Chinese Studies as a blueprint for its other faculties.